Rogue Amoeba today announced the launch of Audio Hijack 3 for Mac, which allows users to record audio from any source, including Skype, Safari, or hardware inputs like microphones. As described by the company, "if it can be heard on Mac OS X, Audio Hijack can record it." Audio Hijack 3 follows in the footsteps of Rogue Amoeba's Audio Hijack, which was first released in 2002, and Audio Hijack Pro, a second version that added additional features and support for various audio plugins. Version 3 of the software introduces a new look and dozens of new functions to make this the most full-featured version of Audio Hijack yet. Audio Hijack 3 includes a new audio capture interface, which lets users see the sound as it's being captured using a pipeline-style view that organizes different types of audio into Blocks for full customization. The most visible change is Audio Hijack's new audio capture interface. 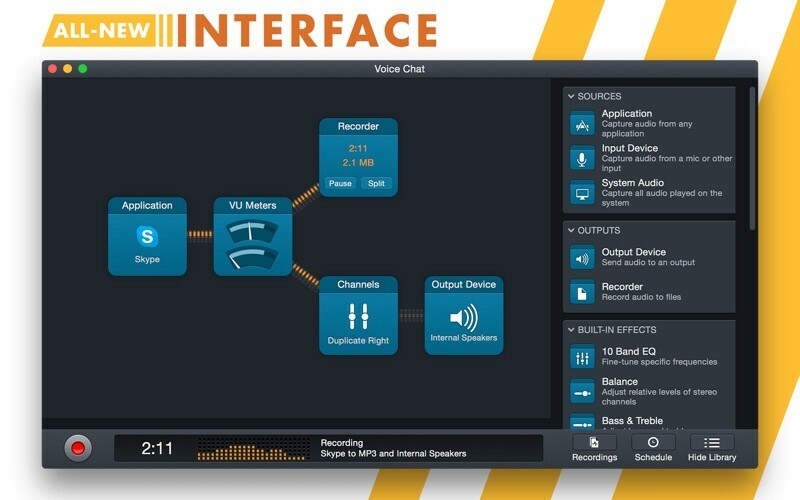 The terrific pipeline-style view of exactly how audio flows makes Audio Hijack 3 a snap to learn for veteran and rookie users alike. Different types of Blocks bring in audio from application and hardware sources (Source Blocks), adjust it with audio effects (Effects Blocks), then record it and send it out to speakers (Output Blocks). The fully customizable layout means users can configure the exact pipeline they need, to get the audio results they want. 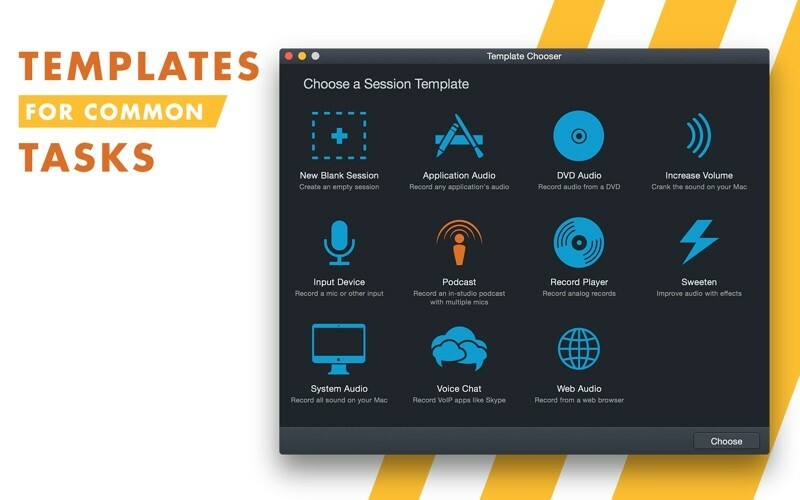 The app is organized into three sections, including Sessions, Recordings, and Schedule, and Session Templates let users complete common tasks quickly. It's possible to record multiple formats at once, or different sources in sync, and there are simple tools for accessing various audio effects. Dirty audio can be fixed with Denoise, Declick, and Dehum tools, and there are new preset options for saving configurations. For the first time, Audio Hijack can record in lossless FLAC format and in high-efficiency AAC. 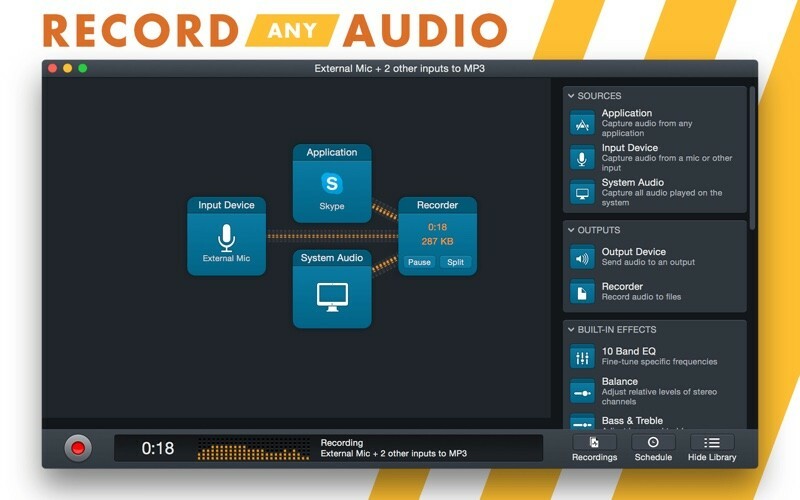 Jason Snell of SixColors and Chris Breen of Macworld have both written detailed reviews of Audio Hijack 3 that are well worth reading to get a solid sense of what's new and how the software works. Audio Hijack 3 is available for Macs running OS X 10.9 and up. It can be downloaded from the Rogue Amoeba website for $49. New users will need to pay the standard $49 price, but people who purchased an Audio Hijack product in the past can upgrade to Audio Hijack 3 for $25. Customers who purchased Audio Hijack Pro since February of 2014 can download the new software for free. I'll stick with free soundflower. $50 seems a bit steep for something that just steals music. If you're going to still music why not use bit torrent? Also there's plenty of blogs that host downloads of music in lossless or FLAC If that's what you want. Yes, there is. "Recording audio" and "stealing music" are two completely different things, and this software is not built for the latter. Audio Hijack is to stealing music as Microsoft Word is to stealing novels. Not on Mac App Store, unfortunately. Prefer MAS. Centralised billing, serial key/details storage, security of payment. I've used Audio Hijack for years. It comes in really handy. I'm not keen on their new interface. What is this current obsession with black windows? I find it much harder to read. I'm hoping they included a way to turn that feature off. It's not just for stealing music. I'm a musician. When I do live looping gigs I use it as a "live direct to two track recorder" at 24-bit resolution. It works well for this and I don't have to bring up a giant DAW app to do it which is more of a studio application. This is quick and dirty and easy to get going. It's also handy to record podcasts that only stream or similar things for archival/reference use. If you're interested, they have an app on the MAS store called Piezo that is a cheapened version of Audio Hijack that does play nice in the sandbox. Is it acceptable to steal an app that was created for stealing music? Been using this for years now to record my local NPR station's morning news program while I'm asleep. I sync it over to my phone when I get up and listen to it on the train in the morning. Every morning, it launches a URL of my choosing (the audio stream), records it and then drops it into iTunes when it's done. For a while I was alternately having it drop the recording into a Dropbox folder, so that works just fine as well. I am using a web browser for the stream, but have experimented with QuickTime Player and iTunes itself, but lately find the web stream the most reliable. Have also used it to grab bits of audio from YouTube for stage production stuff. Haven't tried this new version yet, but these guys make really good products so I'll definitely be upgrading. Their lightweight audio editor Fission is pretty nice too. I use it to record podcasts where I interview guests. It's great for managing the audio streams for both participants and combining them into a single file that I can then edit. Seems a bit unwieldy to use for stealing music.